Anny Bag | It's Sew Anny! Spring has sorta sprung here in Texas and my thoughts have turned to flowers–fabric flowers that is! Fun to Wear Fabric Flowers by Elizabeth Helene Searle is a wonderful resource that guided me through crafting all the flowers above. A 96 page book with fabulous photos and examples. And here we have the same flower styled with laminated fabrics and a hand-painted button from Mood. From that very sling pattern I actually fashioned a laminated bag with a casual vintage vibe that I titled “Welcome Back, June”! in honor of summer approaching and a nod to June Cleaver. 🙂 “Now, Ward, don’t you think you were a little hard on Beaver?” Oh, geez, showing my age again… But it does just channel the fifties, don’t you think? In addition to my journey into flowers, I also sidestepped into headbands. And where did I find those patterns? Just Google “how to make a reversible headband” and YouTube, of course, will have you stitching headbands before you know it! Here are a few of about a dozen reversible headbands I created. Such fun! Easy and quick! Now at Tina’s! During Spring Break, my adorable Gracie, The Fashionista, visited and here is a picture of her latest creation–a purse, and of course, it’s in animal print! Girl after my own heart! One of my favorite Etsy shops, Laminates, provided the fabric (Who’s That Girl? from Robert Kaufman) for this awesome Parisian bag which I deem “Shopping on the Seine.” And the genuine leather handle is from another favorite I’ve mentioned before, Cindy’s Button Company. Then I reverted to my four ruffle Anny Bag pattern. I am continually tweaking (not twerking–although that would be exercise) my Anny Bag pattern, usually fiddling with dimensions. I always think, “Ah, this is perfect!” Then, I adjust it again. What’s that about?? Anyway, the following are three that I have delivered to Tina’s in the last week or so. What do you get with Dismal Weather? Madison’s birthday was last month and she (like her Granny Anny) loves all things British. I had seen an Indygo Junction pattern for a British flag pillow at Quilt Festival. Madison’s room decor, however, wears teal and many other colors other than red, white and blue. Aha! I shall convert the pillow pattern to a bag! Using Amy Barickman’s new Crossroads Denim (which is softly washed and available in many colors), I stitched the front and back following pillow directions, then added a gusset, handles, and lining of navy ticking to create this patriotic bag. BTW, the front and back consist of layering red, white, and navy, stitching along pattern lines, then cutting through either one or two layers to expose the red and white and allow the edges to be rough and free. Love this textured effect! I’ve always been a huge fan of Amy Barickman! Not wanting to leave Europe I guess, my next two bags were fashioned from what I call my Paris fabrics. Ooh La La by Jo Moulton for Wilmington and Salon de The’ Paris by Holly Holderman for Lake House Dry Goods. Two Anny bags, one with a fabric handle and one with a purchased clear bamboo textured handle. Since a bit of the luscious Downton Abbey fabric, licensed to Andover Fabrics, was spotted still lounging in a corner of my sewing cabinet, I decided to give it a whirl in a completely different pattern. I harkened back to a Pink Sand Beach pattern called the Manhattan Bag, which allowed the various Downton fabrics to piece together in a lovely flow. This time the gusset featured the castle fabric. The handle was purchased. I replaced a jewel on the flower with a crown charm, and the necklace type embellishment on the front was a reclaimed charming but broken bracelet. Since this style has a wide bottom and the castle was a light colored fabric, it was the perfect time to try something new–purse feet! Mardi Gras celebrations in Galveston are huge–second only to New Orleans. So my next bag (an altered Amy Butler design) presented with deep purple velvet handles. The look was completed with dangling jewel plum beads and a lush blue violet flower. Did you know that Pantone’s Color of the Year 2014 is Radiant Orchid? The perfect title for a bag fit for a Mardi Gras Ball! The sixth bag was created from a deep desire for sunshine. I chose the most spring/summer fabrics available and fashioned a bag I call Gardens of Paris. The blue floral is a heavy linen, surrounded by a buttery loop fringe and dazzling golden beads. I love this gypsy style, which is a modified Cindy Taylor Oates pattern. Are you a Downton Abbey fan? After fighting the mobs at Quilt Market this year for the official Downton Abbey fabric (exclusively licensed to Andover Fabrics) I was determined to fashion a bag for Downton fans. Thus, the DOWNTON ANNY was created! Adding a feather embellishment to the band, and adorning it with a rhinestone crown, I whisked it off to Tina’s just in time for the Season 4 Premiere. The faux leather handle is from Studio Mio and the interior is lined with the quintessential castle fabric seen here in the first ruffle layer. And so, still feeling those royal vibes, I designed my next bag, “Lady Berkeley.” I’m so in love with the vibrant colors and textured body of this lovely bag, parting was such sweet sorrow. Fashioned from upholstery fabric from Cowgirls & Lace, faux leather for the gusset, and a bold vintage tassel, this bag would feel just as comfortable on the Berkeley campus as it would at tea in Berkeley Square! So until next time, I’m wishing you Happy Times in the Kingdom! Quilters flocking to the door. My new favorite booth: ADORNit. www.adornit.com These gals (mother and two daughters) have developed an amazingly strong presence in the fabric, pattern, and quilting world. You go, Ladies! Snazzy contemporary fabric and a pattern book (plus some charm squares) were scored at ADORNit. If you sew, plan to visit soon for inspiration. This next mother/daughter duo is a booth Nannette and I always take time to visit. Brilliant colors and designs are offered on a number of projects like chair covers, floor mats, travel mugs, mirrors, lamps, shades, clocks and clipboards. Did I say quilts? And more. Dianne Springer finds ways to artistically apply scraps on anything–even mailboxes! Don’t stand still too long–she may find a way to Scrap-o-Late you!! You’ve heard me mention FRAMES. Yes, I succumbed to one of my favorite booths, Mica’s Room. On Halloween, no less. My friends here entice me (doesn’t take much) to buy frames, patterns, clasps and fabric. This year I’m trying coin purses. They do have frames. But isn’t that a great way to practice? My friends from Mica’s Room. This year I purchased antique ribbons, lace, and vintage buttons and fabric at booths featuring embellishments. Many more booths featured bags, bag patterns and hardware this year. Right up my alley! You know I was crossing my fingers for colored denim and I hit the jackpot. Thanks to designer Amy Barickman, Crossroads Denim will allow me to fashion totes, slings, and clutches from a softly laundered denim in shades of orange, navy, blues, greens, and neutrals. I’m so excited! Some ladies at the show try their hand at longarm quilting. It seems as though Nannette ran up a huge total at Quilts By The Bay. Oops! Thankfully, that was just a mistake, but maybe it’s time to turn from shopping to quilts. Hello–it is a Quilt Show! Sparkles covered all the flowers on this quilt. This year $102,800 cash awards were given (and the prizes also include airfare to and hotel accommodations for Quilt Festival.) See all the winning quilts at www.quilts.org. Many specialties were offered in the upstairs classrooms (Nannette and I enjoyed one) and even classes offered right on the main floor amongst the booths. For breaks and a chance to catch a breeze in our fabulous fall weather, attendees are welcome to stroll on the balcony. When you’re in the midst of shopping and viewing, it seems the world is removed (happily so) but it’s occasionally beneficial to let your brain experience the connection of a view of downtown. “Come into the light, Carol Ann…” It’s the corridor that links the George R. Brown Convention Center to the Hilton Hotel. Oh, yes. That walkway reminds us that Starbucks is not a food group. Without even depositing our treasures in our room, we head for the lovely restaurant where the food is actually quite good. After dinner, drinks, and dessert, we drag our loot up to the room and share our awesome treasures. We always vow to get plenty of sleep, but how do you do that when there is just so much to share?? And no sleeping in the next day because, hey, we need to find that fabric we glimpsed yesterday and hope it’s still there! This year we took a class and it was titled, “Crafting an Ideal Day.” It basically involved time management and we learned a lot from the facilitator and the participants. Everyone seemed to have the same problem–not enough time to sew. We lamented this and brainstormed solutions. The main idea that Nannette and I took away from the class was this: Get 20 minutes in your sewing area everyday. This will lead to more, and if it doesn’t on any given day, at least you will have been twenty minutes productive. Naturally, we left the show this year pledging to gift ourselves those twenty minutes. And it may not happen everyday, but, well, it’s a start. So here I go… I’ll bet I could get a small purse cut out in the next twenty minutes. 🙂 How do you get YOUR twenty minutes in? DINNER, A PLAY, AND SOME BURLAP PRETTIES! Catching up on TV – Castle, Blacklist, Chicago Fire, Nashville, Scandal, Grays Anatomy, Good Wife, DIY shows like Restoration Rehab, and I’ll admit it–Days of Our Lives. Surfing the Net – Pinterest, Blogs, NYC travel sites, Trip Advisor, and yes, those YouTube tutorials! Baking – Monkey Bread, plus that Pinterest recipe for putting brownie mix and cookie mix in a muffin tin. SO yummy! Good thing I took it to the party or I would have eaten more than two! 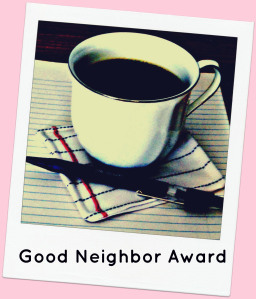 Imagine my surprise to find I’d been nominated for the Good Neighbor Blog Award! Katherine from Pillows A-La-Mode (an awesome site) requested nominations for someone in the blogging world that you would most want to live next door to! The winner was a fabulous blogger, Crafty Staci, that you will certainly enjoy reading. And to the person(s) who nominated me, I send my deepest gratitude! I consider myself fairly new to blogging and as they say in Hollywood, “It’s an honor just to be nominated.” Amen to that! Just for being nominated, I get to display a Good Neighbor Award button on my blog, and you will be seeing that just as soon as I learn how to display it. 🙂 Yep, I still have lots to learn about blogging, my friend. So in this world of widgets, buttons, and stats, please just bear with me! Bag #16 is a pattern I designed called the Jenny Bag. (Publishing it is on my “to do” list.) 🙂 Here it is, fashioned from that sumptuous copper velvety fabric from Cowgirls and Lace, and the Roma Deco upholstery fabric I picked up in L.A. in silver and gold tones. Embellished with four glass beaded tassels, and a beaded golden applique, I’m not sure what to name it. Any suggestions? So…the four Anny Bags. The first is created mostly from velvet and a leopard faux fur. (Can you tell I relish that copper fabric?) I had purchased the leopard flower but added a brooch from my stash from Trims on Wheels for the center. This whole bag is so velvety smooth I could just eat it up! The Western Anny was fashioned from faux leathers and a furry leopard print. Yes, I had these western looking leather straps in my stash from Cindy’s Button Company. The fringe completes the western look. Would you believe the beautiful dangle on the front was from a broken necklace? Don’t you just love repurposing!! Yeehaw! The Autumn Anny (sorry about the pic lighting) is actually made of gold, tan, deep red, and rich chocolate brown floral linens. The linens were purchased from various sources but worked well together. The trim features alternating glass gold beads and silky tassels. The tan leather strap was another past purchase from Cindy’s Button Company. There is a gold brooch flower pendant that I’m making into a removable pin that has the same beads as the trim but it isn’t in this picture because I haven’t quite finished it. Last minute idea. Yikes! I had fun choosing fabric for the Denim Anny. After pairing two shades of denim with a blue leopard, I spotted a feathery trim from Mood Fabrics. Perfect! But, I’ve also been saving this sequined/beaded applique in shades of blue that I discovered last summer at the Pasadena Flea Market in L.A. where a lady was selling vintage fabric items. It made the perfect focal point! I wanted to leave the edges on the denim ruffles raw. If I tried to hem them, they wouldn’t drape, plus I just think it works as a fun denim look. After washing, they came out nicely frayed, so I sewed an invisible row of stitching just above the fraying to lock it in. I honestly don’t remember where I scored the handle fabric. It was funky and totally matched the style of the denim look but the back was a little wonky looking. The fix? Take a navy webbing from my stash and sew the two strips back to back. Voila! Handles! Dang! My Job Is Fun!!! But Hallelujah! On Friday morning, Jen, Madison and Gracie arrive and I will be basking in goodness and laughter and fun! They are my good luck charms for a Successful Artwalk Show! Hope to see you there! Wow! Those YouTube Videos Are Addictive! Just had my two week knee check-up and I’m healing great! AND I’ve managed to complete bags number fourteen and fifteen for the Artwalk Show! Bag #14 shall be named Merry Messenger. It’s the same Ali Foster mini-messenger pattern that I used a few weeks ago and loved. This time I stitched from an embroidered floral faux leather from Cowgirls and Lace, and just for fun, added a textured leopard print strap and a laser cut button. For Bag #15 I modified my Anny Clutch pattern, including adding a tan and turquoise beaded purchased handle. After studying several YouTube videos on making fabric flowers I tried my hand at creating one. Using a teal and tan French wire ribbon, I gathered it into a flower shape adding a vintage aqua and gold button. A little netting that I happened to have on hand was an added touch, plus a circle of felt to cover the back and a pin so it could be removable. There are so many awesome videos out there that it was exceptionally hard to quit watching them and actually try it! (Just Google “Making Fabric Flowers.” Oh, my! A plethora of flowers–fabric, felt, ribbon, lace, sewn, glued–you name it! ) And this last bag was where I gathered the courage to cut that luscious silk velvet from Mood Fabrics, both the teal and soft floral taupe that seem to have an antique look. Forever in Velvet is the name of this bag. But honestly, If you could touch that velvet, you would want to wrap yourself in it. So yummy! Well, I’m two days post op from minor knee surgery–tear of the medial meniscus. Doctor O’Neill says my left knee probably was aggravated by a lot of pivoting motion. Pivoting? So the final blow to my knee was from mucho pivoting?? Hmm, I don’t play sports, I’m not what you’d call athletic these days, and my only real exercise is going to Curves. But wait–! Where was I last month when it really starting hurting so much more? That’s right–L.A. And here’s where the pivots come in. As I explore the Fashion District in Downtown L.A. I see—a fabric store–pivot–another fabric store–pivot–a trim store–pivot–more fabric–pivot–pant pant–well, you get the picture. 🙂 I was in Fabric Heaven and this blog entry is to share with my fellow fabric lovers. Shortly after returning to Galveston, I fashioned what I’m calling the “Spend the Night Bag.” This bag (a variation of my Anny Bag pattern) came together larger than I intended but it’s a fabulous travel bag. Very sturdy straps with metal rings, six pockets inside, as well as another interior cross/bag secure strap and magnetic closure. The fabrics are from Cowgirls and Lace in Dripping Springs, Texas. Ruffles are a velvety upholstery weight, as well as a wonderfully textured faux crocodile turquoise band and strap. But as I finished the bag, I realized it needed a certain something. Velvety upholstery=velvet ribbon, right? So, as scary as it was to actually CUT aaaaahhh! that sumptuous vintage velvet ribbon, I held my breath and reached for the scissors. Hallelujah! This was exactly what my creation was calling for! And in the second picture, feast your eyes on the whole array of ribbons from that beautiful collection. I’m sure you’ll see them in future creations as well. After the visit to Rosa’s shop, what do you think I spied across the street? MOOD Fabrics!!!! Yes, except for NYC, this is the only other Mood Fabrics store! As seen on Project Runway, this store is beyond belief. The pictures do not do it justice. It’s simply indescribable, and the staff was very courteous and helpful. Wish I could just helicopter you all in to see for yourselves, but these pics will have to do. I hope you can enlarge that first picture to see the detail, but keep in mind that you’re only seeing half of the store. If you could look the other direction, you would see a similar scene. Nirvana! The second pic is just a sampling of the vast assortment of beautiful embellishments they offer. In the third pic you will see exquisite patterned silk velvets that I actually mustered the courage to cut recently. Yikes! And, yes, I’ve also used one of those gorgeous hand-painted buttons. Here is a recent bag (an Ali Foster pattern) that I styled with one of those sweet buttons. This blue leopard fabric has an ultra-suede feel to it. The interior is a hot pink satin with pockets. Embellished with a feathery row of black roses, a black tassel, and hand-painted button on the reverse side. Love this pattern and can’t wait to fashion yet another bag with it. On the third day of our vacation, we headed right into downtown, L.A. The Fashion District there is akin to NYC. Blocks and blocks of nothing but fabric and trim stores. (Hence the pivoting and pivoting and….) Avant Trims provided some beautiful embellishments, including the brooch that I added to a previous bag. And Roma Deco had luscious fabrics including a multicolored over 100+ inch wide that I’ve already used for two linings. My favorite was Michael Levine, a huge store that was having their month-end clearance sale. Yeehaw!! This Texas gal dug in and scoured every aisle. I LOVE the discoveries I made, including these fantastic leather flowers and colorful faux ostrich fabrics!! This bag turned out so well, I can’t wait to make another! You can bet your bottom dollar, I’ll be returning to Michael Levine on my next trip to L.A. Thank goodness our son lives there! When we weren’t shopping, we visited Bryan and his lovely lady friend, Liz. All in all, it was a fabulous trip. And once again, Rick was such a trooper, taking his Kindle along and never complaining as I shopped to my heart’s content. I am one lucky gal! My final show-n-tell is yet another Ali Foster pattern that I love. This fabric feels like someone embossed black suede onto white leather–nicely textured. It styles so well with plenty of body to keep the shape of the purse. The pattern called for sewn handles but I had some handles in my stash from a while back that I thought would work well. So I just made some tabs to hold these handles. A velvety, yet sturdy fabric created the bow. Black and white damask with a zipper pocket complete the interior. The pattern called for the bow to have a center of the same fabric but I liked the look of this rhinestone buckle. You probably wonder how this knee setback is going to affect my production of 15 or more bags for the Artwalk trunk show on Oct. 5. Actually, I’m doing quite well (knock on wood) because I have now completed bag #13. Whew! Just writing about all this has tired me out. I’m gonna go prop up this poor pivoted-out knee with some ice. Until next time, HAPPY SEWING! Oh, Happy Day! Imagine my surprise when I delivered a new bag to Tina’s on the Strand and Fiery Fiesta was part of the window display! Fiery Fiesta is the large version of the pattern I designed and now sell in my Etsy shop, Its Sew Anny. It’s called “The Anny Bag Pattern” (a PDF pattern) and the idea originated with a glance at an apron from Pier 1 that had been cast upon the back of my sewing chair. I had been dreaming of a pattern with ruffles but everything I searched to buy had too small and tightly gathered ruffles. There was the perfect configuration in that ruffled apron, and thus, the birth of The Anny Bag. The summery Fiery Fiesta bag was made from Kaffe Fassett laminated cotton. The bag I delivered was Tropinkal Chic. Fashioned from hot pink and tropical laminated cotton, with a flirty pink polka dot lining, this bag is the medium size version of the Anny Bag Pattern. Recently I created another one of my favorite patterns (CraftApple’s Knotted Bag–“Afternoon” size) that I call Paisley Polka. The laminated fabric is a Riley Blake design called Sugar & Spice by the Quilted Fish. And the whimsical turquoise polka dot bow and bib is from Michael Miller. Available in my Etsy shop. And now for something completely different, last night I went back to using non-laminated fabric and created a design by Sue Kim that she calls Hobo Chic. I call it Just Plain Mod! The fabric I chose is straight out of the sixties! It is a durable canvas weight and I lined it with yellow polka dot with two pockets. (This bag is also available in my Etsy Shop. ) As a finishing touch, I added a tan leather button right in the middle of one of the giant flowers. All you need to complete this look is a pair of GoGo Boots! Oh, I’m showing my age… These boots are made for walkin’, right Nancy? Well, that’s just what they’ll do–right up the stairs to my sewin’ room! The Galveston Historical Foundation had also asked Rick and I if we would host a dinner on Saturday evening. They sold tickets, they provided a chef (who was marvelous), they provided drinks, and Rick and I gave a private behind-the-scenes tour of our home. I only had two stress points–the timing and the number of guests. Including Rick and I, there were fourteen seated at our long, long dinner table. Coming up with fourteen place settings, etc. was not an option for me, but Martha Stewart says you can mix and match, right? So that is what we did. I said, “I don’t even have fourteen napkins that match.” My friends said, “But you sew. Somewhere in that stash of yours, you will find enough coordinating fabric to make fourteen napkins.” And sure enough, I had been collecting French fabrics that complemented the French Second Empire style of our house and our dishes. Yes, I seriously sewed fifteen napkins (just in case) and my friends had suggested using raffia for napkin rings. I ended up tying raffia while sitting in bed at the hotel the night before. Eek! Then I decided they looked too Western and the next day I ran to Pier 1 for napkin rings which were perfect. I said, “You know, hosting a dinner party for fourteen would be stress enough, but I don’t even know who I invited!” Since tickets were sold, I had no idea who was coming but, oh, my, it was so much fun! We had a very eclectic mix of guests, to say the least, and by the time we actually sat down to dinner, we were laughing and talking so loudly that the dining room echoed! We made awesome new friends and had a blast. I mentioned timing being an issue. The Saturday tour ended around six, the chef arrived at six, and dinner was scheduled for 7:30. After dinner, everything had to be restored to its proper place because at ten o’clock the next morning, the tours started again! A very sad event occurred the evening before, which was that my father-in-law passed away. He had been quite ill for a long time. Rick was making funeral arrangements up in Houston during this same time, but welcomed the distraction of that Saturday evening. With the arrival of relatives from Tacoma, we were soon grateful to be reminiscing with cousins and sharing awesome memories of a fun-loving, gentle family man, who lived to be 89 years and 5 days. In happier news… Due to a number of circumstances, we have decided not to sell our lovely home! You know, it’s hard to part with something that has just received so many compliments. Since Rick retired in April, he was anxious to get started on clearing the land we have in the Texas Hill Country and start building a weekend home. The thought of moving was becoming an obstacle to other progress. We really didn’t need yet another project. Not to mention I will be keeping my awesome sewing room! I completed an Anny Bag that I call Rhapsody in Blue. Created from Michael Miller, Phillip Jacobs, and Kaffe Fassett laminated cotton fabrics, this item was only at Tina’s a very short time before it was sold. Another laminated bag that I just turned in to Tina’s is an Abbey Lane pattern (The Lucille Bag) that I call Bali Dancing. I seem to be stuck on Phillips Jacobs, Michael Miller and Kaffe Fassett. 🙂 This pattern came together so easily. I have always been happy with Abbey Lane patterns and anytime you have a question, they will respond very promptly. After receiving more requests, I’m currently working on a few more of the bow style. A great pattern by CraftApple.